Day 57: it is possible. 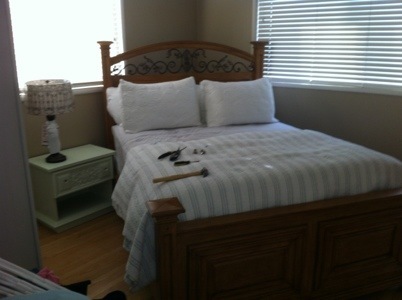 To redo your room with barely any money. Please excuse the crap sitting on the bed. It’s actually not done–later on I’m going to tuft a backing for that headboard (it will cover it and be rounded at the top where the edge is). I really wish I had a wide angle lens, so I could see the whole room (cut off the nightstand and armoire and complete other wall) but I’m proud of myself for seeing this project through. It kept me busy, and I had fun learning what not to do when painting furniture! The best idea ever because I do not sew. Just tie the thing into a square knot and pin it. It looks great! I think the lighter color really enlarges and brightens the space. I can’t wait to see your headboard. Did you get the pillow idea from Pinterest? Thanks so much! 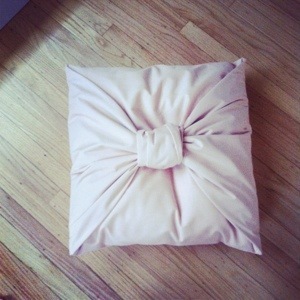 I actually got the pillow idea from craftgawker.com–pretty much the same as Pinterest but all DIY and crafts. Love that site.